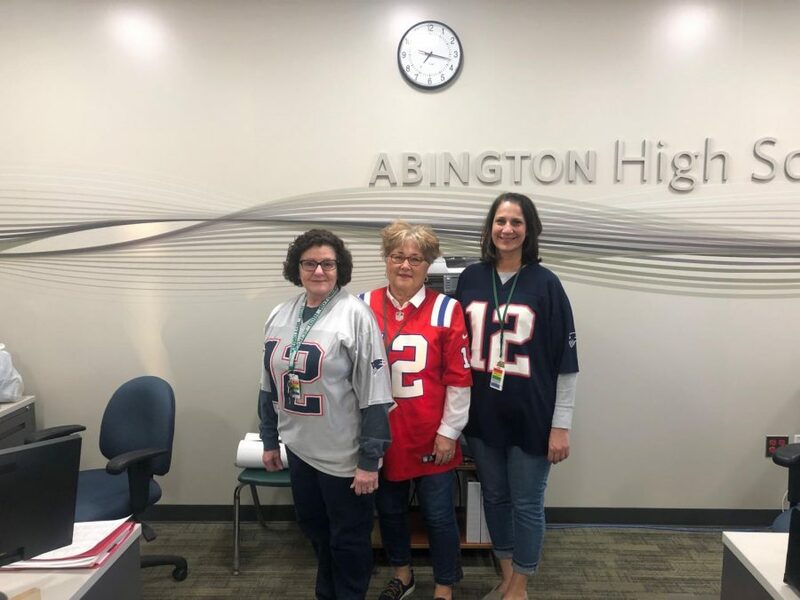 On Friday, Feb. 1, Abington High School students, teachers and staff showed their support for the New England Patriots who will be playing in Super Bowl LIII this Sunday, Feb. 3 in Atlanta against the Los Angeles Rams. There will be some familiar faces such as Brandon Cooks and Aquib Talib. 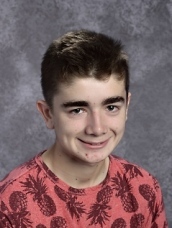 In support of their team, members of AHS could be seen in the hallways and classrooms today wearing a variety of Patriots jerseys, ranging from Tom Brady, to the Ty Law, and even Andre Tippett, whose jersey was worn by John Mueller, a member of the junior class. The secretaries in the front office were wearing Tom Brady jerseys to show their support and love for the Patriots. Other teachers wearing Patriots attire included Spanish teacher Sra. Fry, English teacher Mrs. McHugh, and Science teacher Mr Kitterick. Several Abington students were wearing Tom Brady jerseys like sophomore Rachel Barrett with her “old school” Tom Brady jersey to show off a little history. Rather than the usual sea of green to support our football team, there was red, blue, white, and grey. 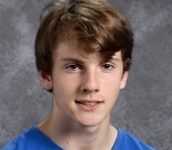 But the spirit of a true Patriots fan runs beyond today’s “Pats Pride Day,” as on any given day many in the school wear Patriots sweatshirts or jerseys. 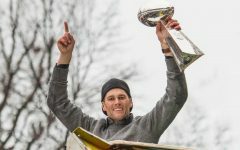 This Sunday, Feb. 3, Abington High School will be rooting on the New England Patriots as they take a journey to try to win their sixth Super Bowl title. If they win, the team will be tied with the Pittsburg Steelers for the most Super Wins in NFL history. 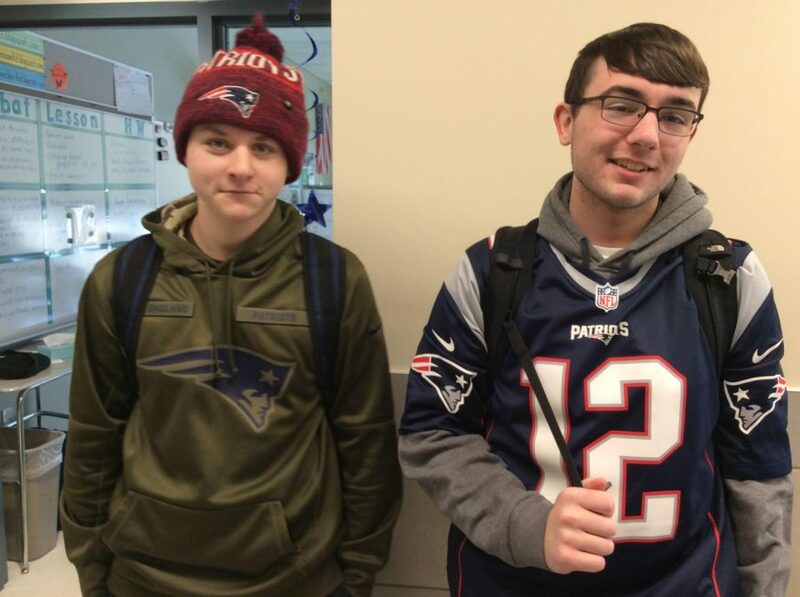 Sophomore Anthony Berardinelli and Junior Jason Ercolano at Abington High School on Friday, February 1, 2019 showing their support for the New England Patriots who will again be in the Super Bowl. This year they face the LA Rams on Sunday at the Mercedes-Benz Stadium in Atlanta.